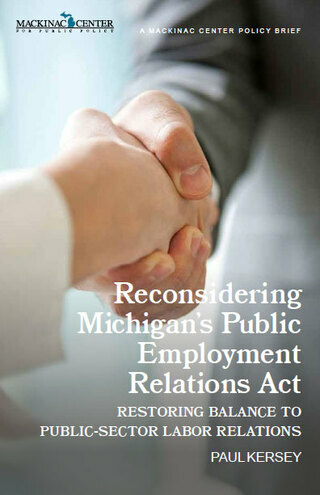 Michigan’s Public Employment Relations Act requires local governments and school districts throughout Michigan to bargain collectively with unions representing their employees. The collective bargaining process is a creation of the state Legislature, which also has the power to repeal or amend it. No area of public policy in Michigan is more in need of fresh thinking than the relationship between government and its employees. With Michigan’s recurring government budget struggles, and with a new Legislature and governor espousing a commitment to performance, efficiency and accountability in government, a new labor law for government employees is imperative. This report outlines a variety of ways the Michigan Legislature can address the damaging impact of PERA.